We are reaching a critical point in our culture and society where we must decide when enough is enough when it comes to our material possessions. Our environment is unquestionably polluted, beyond repair in some areas, and we either live in the mess that is a result of excess, or we transport it to others who then have to deal with it. It's time we make a change in the way we go about enjoying ourselves, away from indulgent vacations which destroy resources and the environment, and towards a lifestyle where our recreational activities are as clean as the scenery and experiences they provide to us. No piece of equipment is carried that does not directly influence the safety of the trip. While we take extra precautions by making sure that each boat has above and beyond the required safety equipment, we do not take candy bars, soda pop, or any trash whatsoever. Every piece of equipment that is taken on the river on a Triad River Tours day trip has a direct purpose related to the safety of our guests. We typically do not stop for lunch on our day trips. Multi day trips are where we go to wine and dine our guests, but all of our day tours are specifically designed to have little to no impact on the river corridor, therefore we do not pull over to make food for our guests, which creates an opportunity for litter or "micro trash" which can then attract insects. We do not have a storefront. A lot of energy must be devoted to having a large storefront. We operate out of two warehouse like locations in Bellingham and Marblemount, Washington. Neither of these requires power 24 hours a day, and each one is meticulously located near the river which we will run that day. All guides are encouraged to commute, and Triad River Tours voluntarily pays for their fuel as long as one vehicle is taken for multiple employees. We run the same section of river repeatedly. Other outfitters are busy driving giant vans, buses, and cargo trucks to and from the various rivers and back again to their places of business. Triad River Tours has made a strong commitment to remain local to what we believe to be a great river system which can provide our guests with the absolute finest whitewater rafting experience. 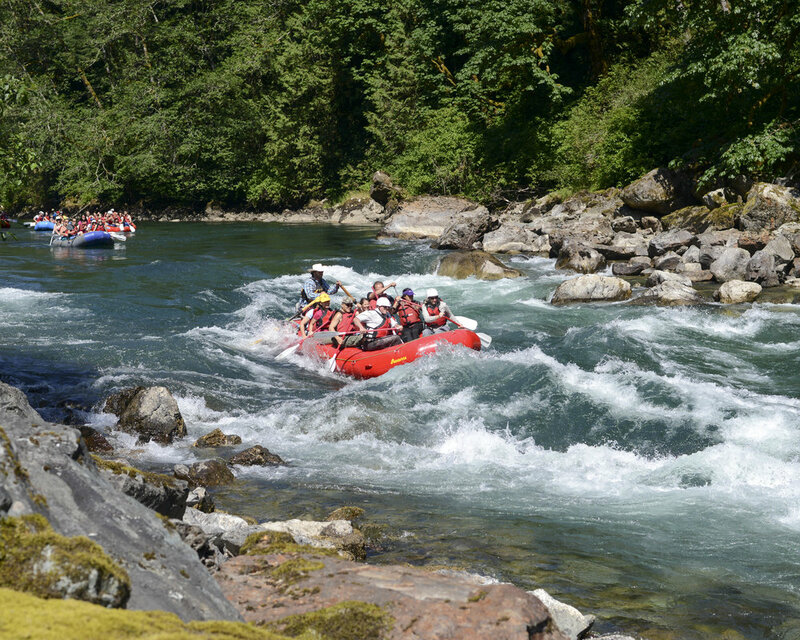 As guides we have yet to tire of the Sauk and Skagit Rivers, and we think with the changes in the river, the changes in the seasons, and the abundance of story telling, social networking, and great wildlife, that you will always see something new on each and every Triad River Tours day trip. We are fast and we are light. One thing notice immediately about our crew is how efficient we are both on and off the boat ramp. We take great care in staying out of the way of other boaters wherever we are, as well as offer our hand and support to any and all who may need help on the river. In an effort to increase our efficiency at the boat ramps and while on the river, we spend significant amounts of time and money researching and purchasing the most updated and cutting edge river rescue equipment we can find, and make sure that all of our equipment is routinely tested and is the absolute best piece of equipment we can possibly find to take rafting with us. We absolutely despise "disposable" equipment, and make every effort necessary to purchase only equipment which will last for many years under even the harshest environments that river rafting can provide. We do not allow plastic water bottles on our trips. Guests who absolutely need to drink water during their 1-2 hour trip on the water are encouraged to bring reusable water bottles that can be fastened to the rafts, so that in the case of a raft capsize we do not add waste or litter to the river system. We go on the trips with our guests. When you go rafting with Triad you go in one vehicle unless it is overloaded and we need a second. There is often no equipment vehicle because our systems are so efficient and our guides trained and prepared to run the trip with you for the greatest experience. Our systems are so efficient and quick that our guests can go right along with us to the river. Furthermore, since we voluntarily and intentionally limit the size of groups on each Triad River Tours River Tour, we do not need to "stage" large amounts of equipment at the river before we get there. Leaving equipment at the river is a poor and unprofessional practice in the view of our river managers, and should not be necessary with a highly trained crew of rafting guides. Triad prides itself on making a small footprint on the river, on the boat ramp, and on the road. Our guides all share one critical viewpoint: less is more. All Triad River Tours guides are trained to the highest degrees of effectiveness for safety, rescue, and professional hospitality. Furthermore, Triad makes sure, during the hiring and training process, that the values of our company are held in the hearts and minds of all of our guides. When we pay guides a wage well above the industry standard, and we are clear of our expectations for them as professionals, we have seen that these people have the enthusiasm and care to show our guests a great time. Guides make the trip, and we at Triad are well aware of that. 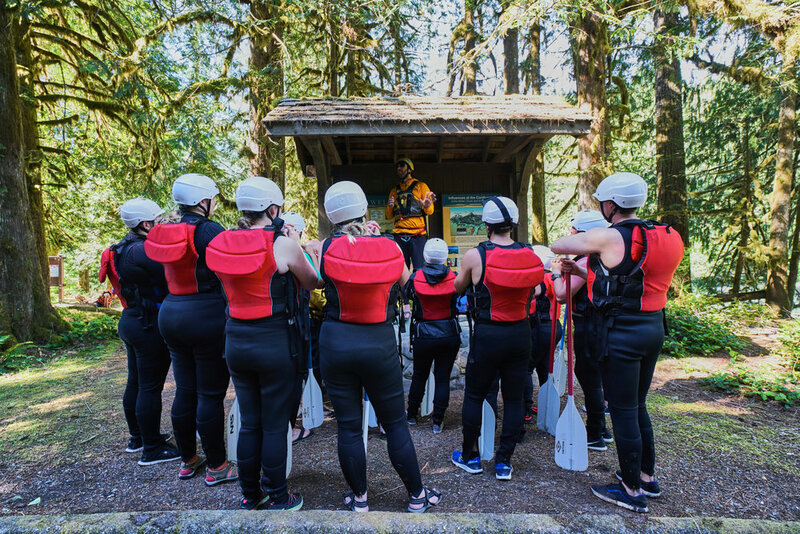 Whitewater rafting and scenic float trips can be ran by a number of different companies, but when you ride with us, with one of our guides, you support a company that exists for a purpose. All of us want to act as stewards of the river, and work to guide you as you take in your experience with nature on your river tour. We pride ourselves in doing this in the safest, most effective, most efficient manner. Triad River Tours operates under continuously evolving safety protocols and mechanisms. Before any decision about how and why a trip operates a certain way is adopted, there are fundamental ethics that must first be considered. What is our primary objective in our trips? First and foremost, we value human life and the environment. It is actually the synergy of these two things which provide the platform for our trips to have meaning, without an awareness and honor of the two, our trips will lose their potency, and thus our customers will fail to see their value, and ultimately we will not only have failed as a business, but we will have failed to live up to the demands of our own conscience. Triad River Tours has no storefront, no building by which we stop in every day. We commute to our trips every day just as you do, together. We meet all of our guests at the river because we waste less fuel. We run our trips with very little stoppage because we then never impact the riverbanks and the forests which we want to continuously explore with our eyes. We do not take food onto the river. We know that guides can pick up all trash along the way but we simply just don't go there. Too many pop cans line the bottoms of our rivers and too many plastic water bottles are found at the rivers edge. Triad River Tours wants to set an example for the future of our industry by remaining simple, efficient, and minimalist in our approach to the river. Keep it simple, keep it safe, keep it clean. Guides and guests of outdoor expeditions can be agents of peaceful travel through the wilderness or they can become agents of destruction. For many years before we ran trips on our rivers there have been serious negative environmental impacts. The remains of those impacts can still be seen, considered, and discussed on our trips. We are here to expose our guests to mother nature, and to facilitate the relationship between the two, but we do not believe it is our right to provide a great experience to our guests at the expense of the environment; furthermore, we do not believe that it is necessary to destroy the environment in any capacity in order to provide an excellent experience for our guests. Litter is the first and most rudimentary way in which the environment can be destroyed while on the river. Destroying riverbanks is another. Many river companies have created their own paths into and out of the river corridor, in order to give them more efficient access to the sections of river they want to run. Triad only utilizes pre-existing entry and exit points which have been deemed useable through geological impact reports, and of which we are authorized and permitted to use. Triad will never destroy habitat in order to do business. The only time we would travel off of pre-existing trails and routes would be in case of a life threatening emergency. Rafting equipment can become litter. Too much equipment is not the hallmark of our company. Rather, it is our habitual pattern to utilize cutting edge equipment which gets the job done. Our equipment is never too old or worn out to be used on the river, and thus we do not have to worry about it becoming litter. Our ropes, our rafts, and all of our equipment remains contained and tied in to our boats so that in case of an emergency the only things floating down the river are paddles and people. We do not believe it is necessary to carry "all the comforts of home" down the river with us, and believe that the safest trip is the one which focuses on bringing only the items which will keep people safe and/or rescue someone in the event of an emergency. All of our trips take a "blue bag" which is a Watershed brand sealed and waterproof bag which contains, at a bare minimum, all equipment listed under Chapter 308-312 in Washington State Legislature. But we look at the law as a moral bare minimum. It is our responsibility to start there. When you use higher end, more cutting edge equipment, it is often lighter and smaller, so you can have more of it in the same space. Each rescue "blue bag" in our boats contains a spare Life Jacket, First Aid Kits, Evacuation Phone, rescue hardware, and other necessities. Because all of our equipment is contained we do not risk losing it in the river in case a raft flips over. We only leave footprints, we only make memories. Triad River Tours looks for opportunities to donate time and resources to non-profit organizations which are dedicated to preserving our natural places. We work closely with government personnel to ensure that our lands are protected and that we are always abiding by the most stringent environmental practices while on the river. It is our goal to take as many people down the river as possible, and to leave it in exactly the same condition as we found it.